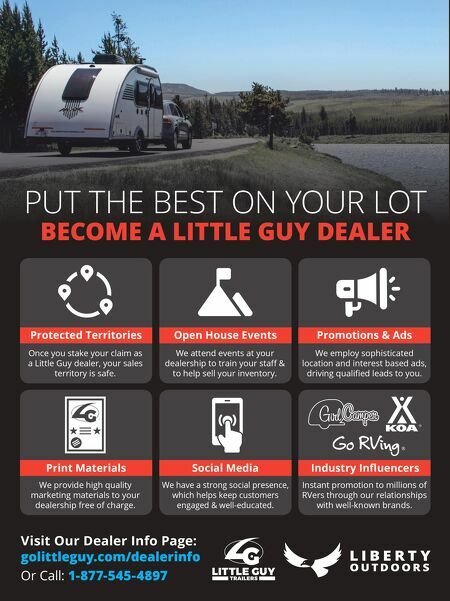 PUT THE BEST ON YOUR LOT BECOME A LITTLE GUY DEALER Visit Our Dealer Info Page: golittleguy.com/dealerinfo Or Call: 1-877-545-4897 Protected Territories Print Materials Open House Events Social Media Industry Influencers Promotions & Ads Once you stake your claim as a Little Guy dealer, your sales territory is safe. We provide high quality marketing materials to your dealership free of charge. We attend events at your dealership to train your staff & to help sell your inventory. We have a strong social presence, which helps keep customers engaged & well-educated. We employ sophisticated location and interest based ads, driving qualified leads to you. 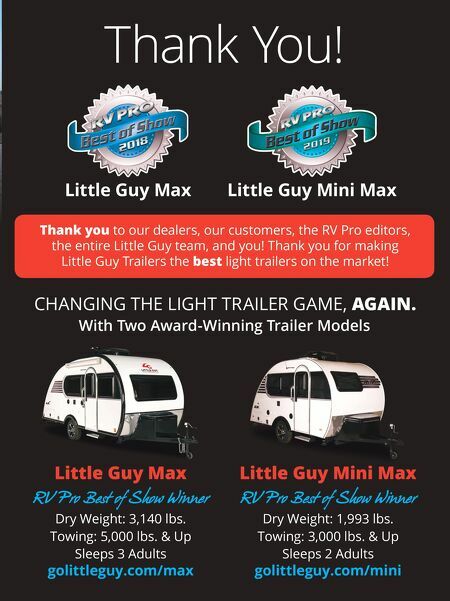 Instant promotion to millions of RVers through our relationships with well-known brands.